After a sabbatical abroad a few years ago I was appalled when I returned to campus to find a huge billboard—the kind that has lights that can change the announcements and ads—looming over the freeway from the edge of campus. It was advertising a musical group coming to perform at the university’s new indoor arena, called Cox Arena in behalf of its major corporate donor, Cox Communications. I dashed of an email to the President, congratulating him on the sign, and adding that it will prove useful when he opens a casino on campus (no reply). The sign, which depressed many faculty members, and angered residential communities across the freeway forced to read that some washed up entertainer was coming to campus, or were urged to buy season tickets for SDSU’s sports teams, was just what I needed to help me decide about the retirement I had been considering. Not a small part of that decision was a longer forming disillusionment with the university, its inexorable selling out to values—what I would call corporate values—of managerial mentality, “productivity,” and outright hucksterism with the coin of its already plummeting academic standards. I had had enough. Sometimes I miss the classroom, especially the seminars, but I don’t rue my decision to retire. Not when I can hear a report on public radio of how SDSU proudly offers, through its Department of Hospitality and Tourism Management, a degree in Tribal Gaming Management. I am not making this up! Apparently this is made possible by a nice chunk of greasy money from the Indian casinos. (See, grandma isn’t really squandering your tuition in those slot machines; it’s coming right back to support your education.) This is the kind of stuff that used to be offered in those trade schools, but hey, ya gotta follow the money. (I wonder if they have a course in how to fill out those “Hi, My Name Is . . .” badges. Is there a course in how to spot card counters?) This process of the sleazing of universities started with the State Lottery, sold to parsimonious California taxpayers (other states have done the same) on the idea that rather than pay taxes we could let people gamble for their higher education. What the campuses ended up getting was chump change, while the people who know what these slimy enterprises are about skimmed the big bucks. And over in the SDSU Division of Extended Studies Division are some certificates that can be earned in Casino Gambling . It offers a course in “Introduction to Indian Gaming – Past and Present.” Past and present? (The past ? Were the Sioux of old betting on which buffalo would make the next meadow muffin?) There’s also a course in “Understanding the Profit Picture” of casinos. Great, does this include how to make sure the “house” always comes out ahead? You can take a course in “Casino Surveillance and Security.” I saw a commercial with a clip of a student saying how hard head had “studied” how to deal from a Black Jack deck. I guess the public’s cards are coming off the bottom. In fairness it must be said that our stingy legislators have contributed to this situation. Too terrified by the anti-tax crusaders they have forgotten that more than any other factor that has made California the fifth largest economy in the world is it’s (erstwhile?) world class higher education system. Today it seems that campus presidents and administrators in pursuit of bucks to fill the revenue void are measured more by the bottom line as they hob-nob with car dealers and porta-potty millionaires in their stadium sky boxes, or on the golf courses. But let’s not just blame the administrators. Showing some profiteering profs a little green has already been bringing about some faculty free enterprise. We’re leaving out drugs, one of the potentially most lucrative areas for corporate sell-outs. Some Professors of Pharmacy have sold out to drug companies for research funds, consultancies, and, in Texas, seats on state boards overseeing drug protocols for patients in state hospitals. Novartis, the Swiss pharmaceutical company offered UC Berkeley $25 million over five years to enter into a “research partnership.” In return, Novartis wanted to sift through the research of the department of plant and microbial biology at Berkeley’s College of Natural Resources, and hold the licenses up to about one-third of the researchers’ output. The corporate boys wouldn’t ask if they didn’t think they could pull off such deals. Corporate fascism always lies not far beneath the surface of the norms of capitalism. These days, emboldened by the favoritism of the Bush administration and its de-regulationist posture, corporations are insinuating themselves into the few remaining institutions that have not been corrupted or bought off. I regularly get emails offering me a “Christian refinance” on my residence; the congressman representing my district is being investigated for taking bribes from defense contractors. There are already dozens of “fast-food” educational institutions that rent space in shopping centers offering quickie Ph.Ds in a few weeks (you can get years of academic credit for your “life experiencve”) . 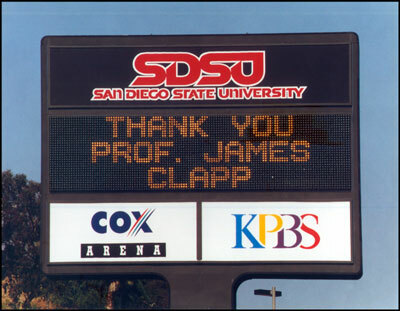 So I can only wonder what passing motorists on the freeway thought that Prof. James Clapp was being thanked for, since there is no mention of his retirement from 33 years of teaching. Maybe they are just glad I’m gone. Since I am an “Emeritus Professor of City Planning” I could return to contribute to the university’s new mission. I’ve been tinkering with a new course idea: “Whorehouses, Casinos and Strip Joints: Iniquitous Land Uses and the Sustainable City of Tomorrow.” I would have a lot field trips; the university likes it when you do things to boost enrollment.